I have been having fun every morning this week, taking new photographs of old socks—Modeled on the new manikin legs, natch! I haven't finished. Sometimes, I think I've taken a photograph but for what ever reason I didn't (nor did I think to double check!) I think it is that some socks are camera shy. One pair -forest green ones, are so camera shy I can't find them! A few more pairs got worn, but not washed before I started this re-imaging project, and are out of the running for being photographed right now. They will have to wait a bit before being photographed- since I don't think they will be washed this weekend. And the lone Regia silk sock remains partner-less. I just know if I throw it out, I will find the mate the very next day! But in spite of the setbacks, I have managed to photograph 39 pairs of socks. There are at least 5 more pairs to come--1)My denim stripe socks (I have knit an almost identical pair for Miss B), 2) the taupe and tan and black lace sock, 3) the self striping yarn in RoyGBiv stripes, 4)another self striping mutli color pair, 5) and a grey swirl socks—which will bring the total (minus the forest green) to 44 socks. And there are the ornate turkish style socks.. I don't think they will look their best on the manikin legs, but I'll try. The turkish style socks have been worn, but they are not in the regular rotation. They are special occation socks! Some of the socks in the collection are old, and a bit stretched out, with wear. One pair in the collection is about 5 years old—and never been worn! There are toe up, and cuff down socks,, simple socks, and elaborate detailed ones. You can see the collection—now, or when it is complete in a week or so, on Facebook, even if you are not on Facebook. 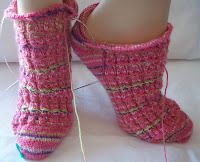 Of course, in another week, the Cotton Candy socks will ready to join the gallery! The heel is OK—it could be a bit deeper (the bowl and the lid are both too shallow.) It's not so bad that I was tempted to frog and start over. But next time –and there will be a next time!--I'll work more short rows and improve the fit. Most of my socks have to be coaxed into looking good on the manikins—eased here and there, to hid the ripples caused by the socks being both too wide and too long to fit properly. Tomorrow, more progress I hope, on the Cotton Candy socks, and some yarn pron. Some Koigu fell into my hands, and while Koigu is not in my top 10 of favorite sock yarns, the price was right, and it reminded me, I have 5 skeins of Rowen Summer Tweed, in almost the same color. If the summer tweed turns into a cropped, short sleeve summer jacket, and the Koigu into socks (and then fades!) they will be the perfect match. But I don't think the Koigu will become socks any time soon. They might not make their debut as socks until next summer. The color is a bit closer to orange than to coral--but.. socks are worn far from my face, and they will be fine, even if they stay a bright color orange.